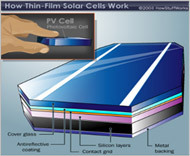 Solar PV panels made with silicon are presently the most common solar technology available. Solar PV panels absorb light from the sun and convert it into electricity through an array of crystalline silicon cells (solar cells). These cells are infused with a conductive material, such as copper, which outputs DC (direct current) electricity. When photons coming from the sun hit the solar panel they generally pass through the solar panel, reflect off the panel, or are absorbed by the solar cells in the panel. The quality of a solar panel is measured by how much light it is able absorb and turn into electricity. 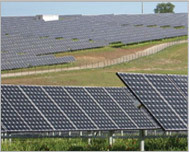 The effectiveness of a solar array depends on the quality of materials used in its construction, as well as the design and installation of the system. A solar water heating system captures energy from the sun using a solar collector on the roof, and transferring that heat energy to a hot water system in the building or home. 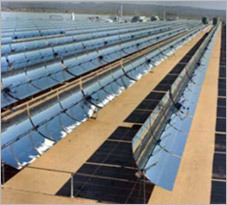 Solar concentrator systems utilize uniquely designed mirrors or lens systems that concentrate light energy which is then absorbed by another component of the mechanism. 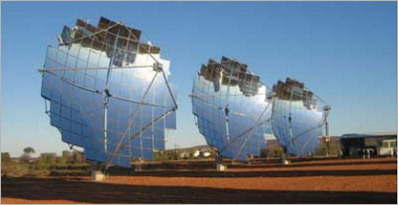 There are two primary types of solar concentrators: those that use a Frensel lens to enhance the efficiency of a solar panel directly, and those that use parabolic mirrors to focus the light onto a much smaller space, which then can power a water heater, steam turbine, or electric generator. This technology is similar to a tradition solar panel in its direct absorption of light energy. However, instead of mono-crystalline or poly-crystalline solar cells, amorphous silicon (a-Si) is used to capture light energy. 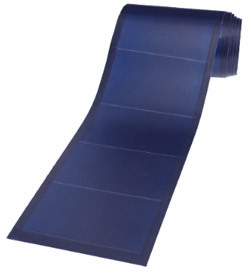 This results in a solar panel that is highly flexible and can be used in a wide variety of applications.